The Rubber Cafe Design Team Blog: Every Day Is A Picnic! Every Day Is A Picnic! I have a fun summery card for you today using The Rubber Cafe's Home of the Red White and Blue Creative Cafe Kit. For this card I wrapped a piece of white cardstock with the star vellum included in the kit. The top and bottom edges are wrapped around the panel and taped down. 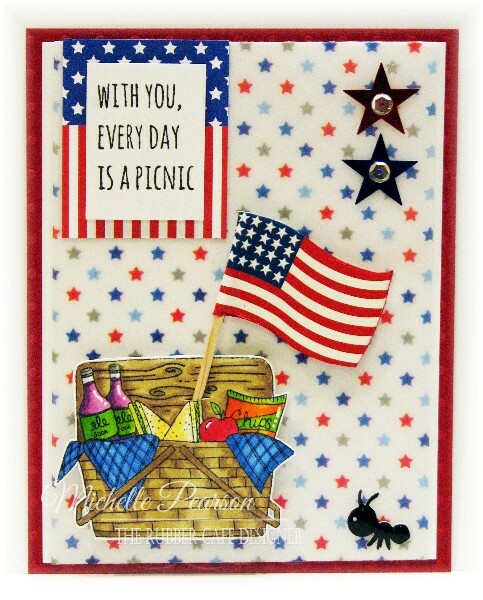 I stamped and colored the picnic basket image with Copic markers. I fussy cut the image and cut a slit above the sandwich to stick the flag through. I popped the basket up on foam tape so there was room for the stick behind the image. For the sentiment piece I cut an element from the paper pad and then popped my image on top of it with foam tape. I added a few stars and sequins and for a final touch, and ant sticker from the kit.